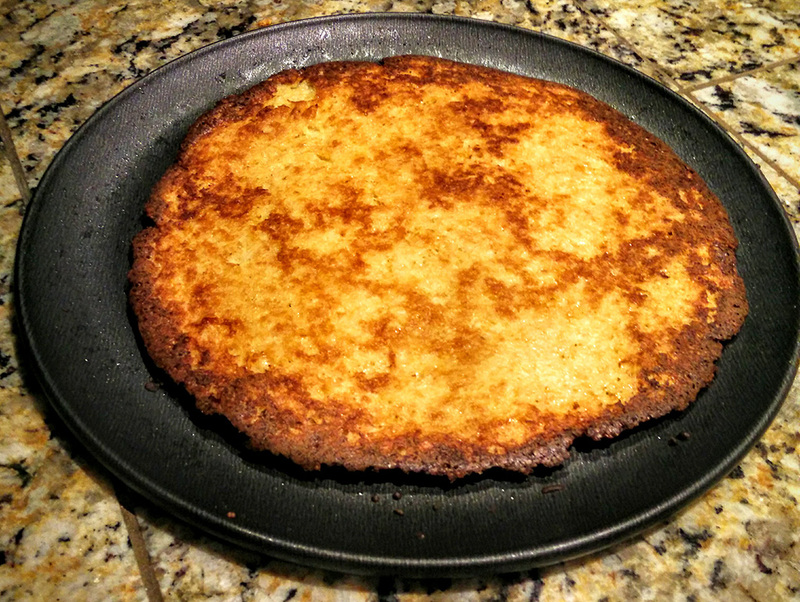 Update: The also ketogenic almond-mozzarella version is superior to texture and taste to the following cauliflower pizza crust. 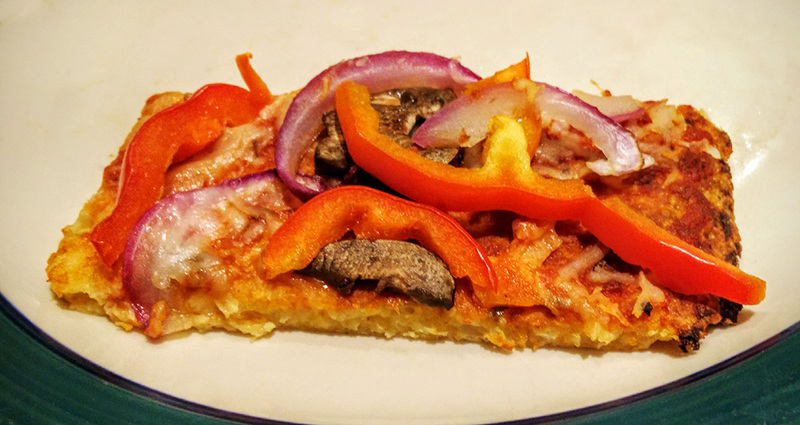 This is the best version of the well-known in the low-carb circles, cauliflower pizza. The original versions were using cauliflower as-is, and mozzarella cheese, which resulted in an extremely “mushy” pizza. This version retains much less water by cooking the water out of the cauliflower first, and using a hard cheese type. This version also holds together better than the mozzarella version, so that the crust is freezable for future usage. This is why the recipe below is for 4 crusts, and not 1. You prepare these once, maybe a weekend afternoon, and then you can have pizza available almost immediately in the future! I could even argue that if it’s just you in your household, you can cut the baked crust in two, and freeze it / re-bake it as halves, because this pizza is super-filling (due to being high-fat)! My husband barely managed to go through half of the pizza, and I managed only 2/3s of the other half. 1. Cut the cauliflower into 4. Put 1/4 of it in the food processor and run it using the S blade. Run it until the cauliflower resembles small grains (smaller than you would cut it for cauliflower rice). 2. Place the cauliflower into a large pan, without any oil, and under medium heat, cook out the water. It can take 10-15 minutes to do so, stir often. 3. Transfer to a big bowl, and let cool. 4. Continue steps 1-3 with the rest of the cauliflower parts. 5. Add 1/4th (about 110 gr) of the cheese in one of the bowls, 1 egg, and the optional 1 tbspoon of almond meal. Mix well together using your hands, and you will see now that the mixture holds together. 6. Put some parchment paper on to a pizza baking pan (I bought two of them), transfer the dough on it, and shape it using your hands. Make sure the edges are not too thin, or they will burn out too fast. 7. 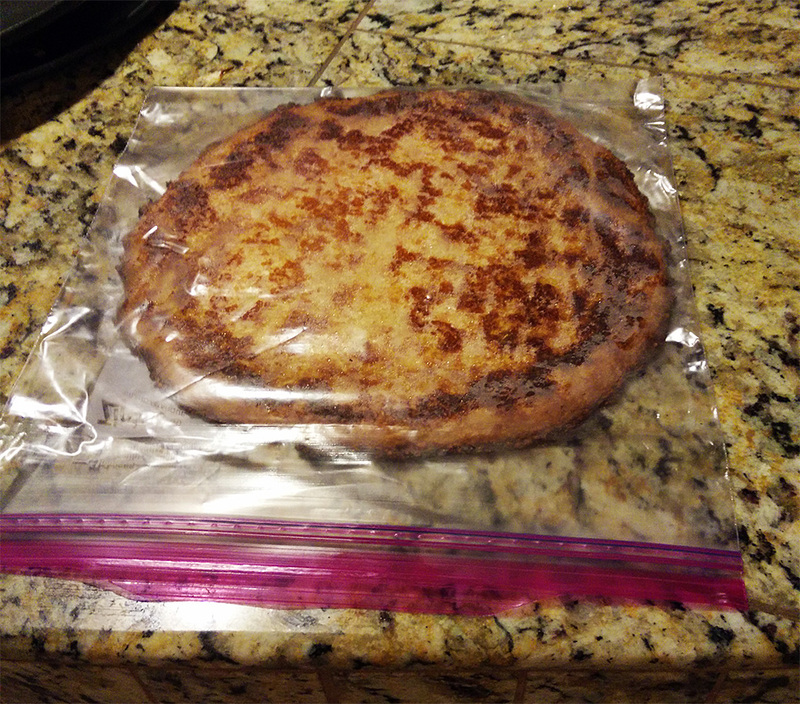 In a preheated 400 F (205 C) oven, place the pizza crust, and let it bake for at least 15 minutes. Using a spoon, lift it slightly, to see if it has baked underneath or not. – A. You add the toppings (sauce, cheese, veggies) and bake again for another 8-10 minutes. Eat hot! – B. Put back as-is in the oven (without toppings), and bake until the bottom is golden brown too. Remove from the oven, let cool well, and then freeze it in a large plastic bag in the freezer (make sure it’s placed completely flat). When you want to bake them in the future, preheat oven to 425 F, let the dough to slightly unfreeze, place your toppings, and bake for at least 10 minutes. 9. Do steps 5-8 with the rest of the cauliflower. Enjoy your future pizzas! Note: While this is a healthier pizza overall, it still contains obscene amounts of cheese. Especially Parmesan, with its high natural MSG, could create problems to some people. One of the best side-dishes you can ever hope to taste in your life, guaranteed. Often served in Greek restaurants. Picture below is from my pre-Paleo days (hence the bread). 1. Preheat the broiler to become very hot (500F). Place the rack close to the broiler’s heat. 2. Cut the feta cheese into a 1 inch thick, long rectangle (if not already cut as such). 3. 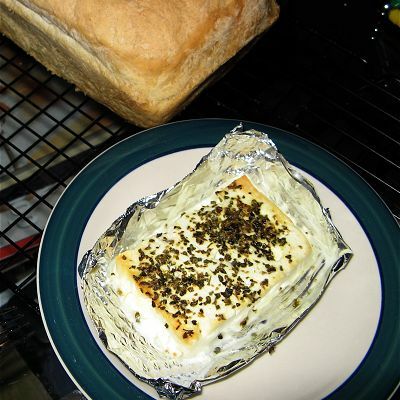 Cut a square piece of aluminum foil, fold it in two, and then shape the edges vertically with your hands (in essence, shape it a small oven dish out of the foil). 4. Place the cheese on the foil. Pour the olive oil on top of the cheese and then use your finger to spread it evenly. Pour a generous amount of oregano on top of that too. 5. Place in the oven and broil for a few minutes, until golden brown. Serve hot with crackers. No need to remove the aluminum foil. We generally don’t use much flour in our home (Paleo-approved flours or not). Except for crackers that is, to keep happy my French, cheese-loving husband. 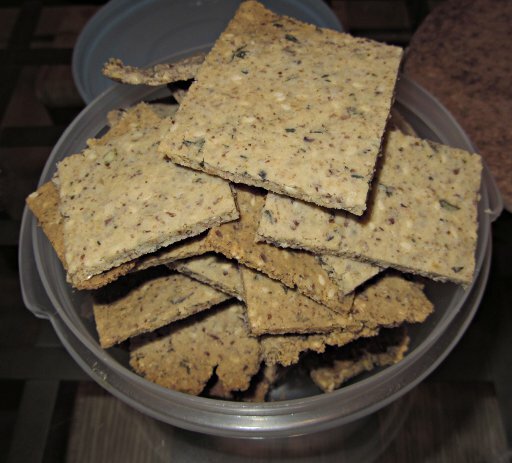 The recipe below makes for some amazing gluten-free cheese crackers, and he says that they’re the best cheese crackers he had in his life. And he has tried quite a few so far. * 1-2 TBspoons of finely minced, fresh herbs you have around: rosemary, thyme, sage, oregano, marjoram, lavender, mint, basil etc. 1. In a big bowl put all the ingredients together and start working the mixture with your hands. Soon it will become a well-rounded ball. 2. Cut out two pieces of parchment paper, as long as your cookie sheet is. Preheat the oven at 350 F (175 C). 3. Lay down your ball mixture in the middle of one parchment paper, and try to spread it a bit with your fingers (just enough so it’s not a ball anymore). 4. Place the other parchment paper on top, and using a rolling pin, spread the mixture across the parchment, as equally as possible. Aim for a thickness that you desire (I go for a pretty thin texture). If you spread it too much on some side, you can always remove that part, and re-spread it. 5. Remove the top parchment paper and throw it away. Using a pointy knife, cut out a grind in the spread, creating rectangles of about 2.5″ diagonally (be careful to not cut the parchment paper). 6. Place the parchment paper with the mixture on the cookie sheet, and bake for 8-10 minutes. Then check it out to see if the edges are starting to brown. If that’s the case, remove the cookie sheet from the oven, and using oven gloves, cut out the rectangles that are already done and let them cool on a cooling rack (they will be soft at that point, but they will harden as they cool). Put the rest of the undone crackers back to the oven for another 2-4 minutes (monitor them). 7. When done, remove them from the cookie sheet and place them in the cooling rack too. 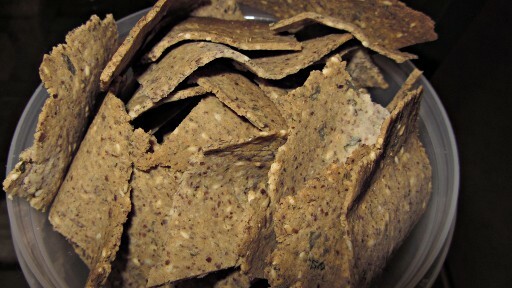 Half an hour later, break-out the crackers in their predefined grind shape. They now are harden and ready to eat. Keep in an air-tighten bag for up to 1.5 weeks.